I think this is the first cookie that I decided was more trouble than it was worth. 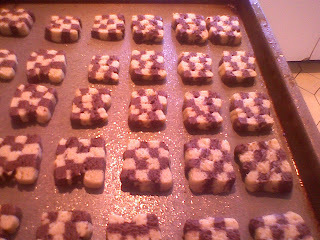 These are checkerboard cookies, and this recipe comes from DyannBakes.com, a site which is sadly no longer in operation. Anyway I made these in a spurt of adventure and inspiration, wanting to try something really outside my comfort zone. I don't generally make icebox cookies (where the dough is formed into a roll or log and chilled before slicing), but these looked oh so pretty, and I decided to give them a shot. This recipe involves making the two different doughs (chocolate and vanilla), and layering them into the pattern you see above. Ooh boy, this is where it gets complicated. Plus, Dyann's instructions come exclusively in a video form, where you watch her do it. Yeah, I watched that video about 472 times. Basically, you keep layering (and sticking together with egg white) and slicing the dough until you form the adorable little checkerboard pattern. Layering and slicing, layering and slicing. I was sweating by the end of this one. Panicking as layers slid out of place and edges were sticking out, and the doughs weren't sticking together. After a lot of praying and just a few mild obscenities, the logs came together and after I chilled them, sliced out into cute little slices. Well, they did come out nice, although even in the picture you can tell alot of them are uneven, or have jagged edges. I'm just not sure I'd go through this again for this cookie. Plus, if you promise not to tell anyone, I'll share a secret. They just didn't taste that great. Tip of the Day: If a recipe calls for two different doughs, make the vanilla one first, that way you don't need to clean the bowl in between batches.